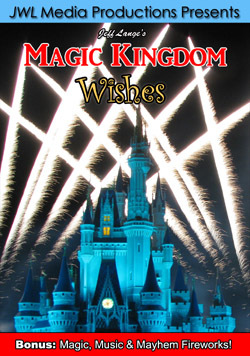 I just returned from a very busy schedule at Walt Disney World. I attended and recorded the first two Star Wars Weekends plus covered American Idol winner Kris Allen’s visit to Disney’s Hollywood Studios for Jim Hill Media (my article is HERE). 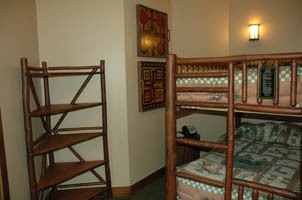 I also recorded footage for upcoming DVD titles featuring the Animal Kingdom Lodge and Kidani Village. 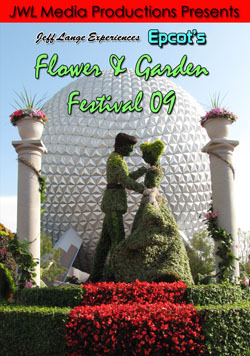 Finally, the trip ended with the special D23 Flowers and Fireworks event Sunday night at Epcot so be sure to check back for a full report soon! I had the great honor of being one of the first to visit inside a newly-opened Treehouse Villa at Walt Disney World’s Saratoga Springs. 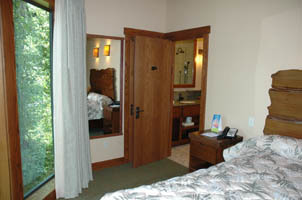 June 1st was opening day – the treehouse villas had been soft-opening for a week or two. I’d already had the opportunity to visit the property previously and to talk with an Imagineer and designer of the new villas. The treehouses look similar on the outside to the previous incarnation, though they are only one level inside (above, left). 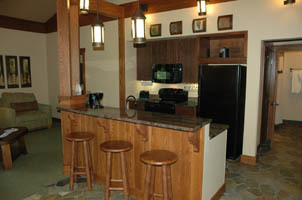 There is a fully equipped kitchen with bar stools at the bar area (above, right). The living area is spacious and beautiful, with plenty of space for a family to enjoy television or to dine (above left and right). 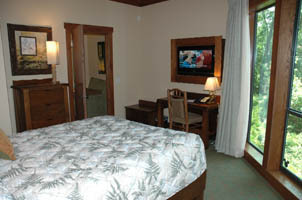 There are 3 bedrooms, all with flat-screen televisions (above left and right). 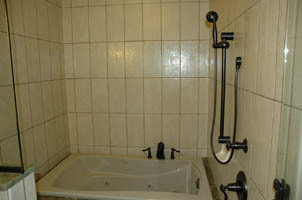 The master bathroom includes a jacuzzi (above, left). 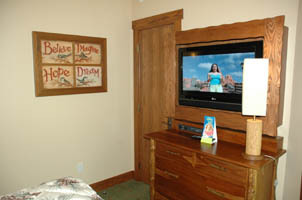 A set of drawers sits under the flat screen television (above, right). 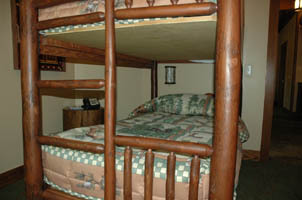 One room includes bunk beds (above left and right). If you look closely you can see the treehouse and woods on the comforter. 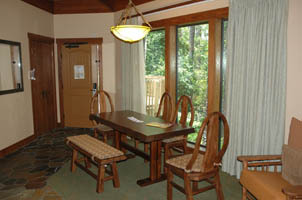 The dining room table can easily sit 6 (above left) and there are stairs that lead you up into the treehouse. (above, right). The handicapped accessible units include a long, sloping ramp. 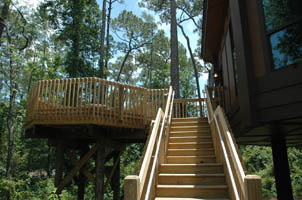 Special thanks to Steamboat Bill from Mouseowners for the Treehouse Villa access! 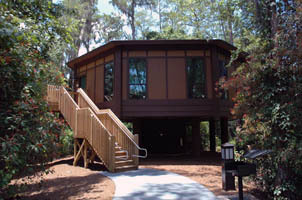 For more great opening day treehouse photos, please check out the new MouseSteps update HERE! 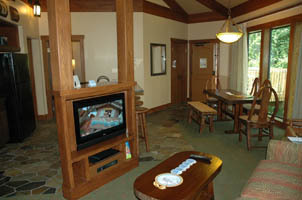 This is a 5 minute tour inside a newly opened Treehouse Villa at Walt Disney World’s Saratoga Springs DVC resort. They are really beautiful! 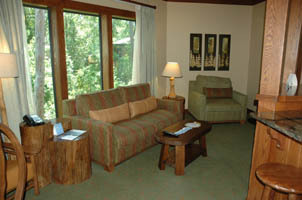 The Saratoga Springs Treehouse Villas officially opened June 1st. 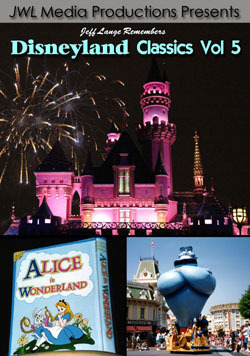 They are a Disney Vacation Club property.